Everyone who wants to smoke pot basically can. It's who the cops arrest for it that shows why we need legalization. When you read of the origins of the so-called "war on drugs," and particularly the criminalization of marijuana, it really makes you think. Former Nixon domestic policy chief John Ehrlichman told a reporter, years later, that Nixon knew that they couldn't go after hippies and black people for being against the war, but they could, if they demonized marijuana and trumped up the problems with heroin, go after them for that. They made a cynical decision to go after people who used substances that they knew weren't bad at all. "Did we know we were lying about the drugs?" he said to the reporter. "Of course we did." But if you’re really looking at it, you can’t possibly say that marijuana is worse than alcohol or that its effects on society are worse. I mean, I think that alcohol is fantastic, but if you compare the impact of alcohol on your body and your mind to marijuana, they’re pretty similar and one is addictive. If you had to say one is worse for society than the other, it would be pretty easy to make the case that alcohol is. Black and brown people are disproportionately arrested for marijuana possession and minor dealing charges, while most of the rest of us are not. The reality is that my friends who went to Colgate University (and a lot of other schools) have all smoked marijuana, but I only know one person who was ever arrested. Marijuana is, however, a point of friction between police and African Americans: Black and brown people are disproportionately arrested for marijuana possession and minor dealing charges, while most of the rest of us are not. But, even with states legalizing, the federal government has clearly decided to target marijuana again. And they can because, at the federal level, marijuana is classified alongside heroin and cocaine, though that's just laughable. You can tell that Attorney General Jeff Sessions is seriously going after legal marijuana, despite it being politically tone deaf, from the absurd things he says about it. He's like Sergeant Stedenko in "Up In Smoke" — he's the one guy who's hanging on to these outdated stereotypes. You can tell that Attorney General Jeff Sessions is seriously going after legal marijuana, despite it being politically tone deaf, from the absurd things he says about it. Marijuana has been a very integral part of our comedic writing process from the very beginning. We smoked before we even had a comedy group, and we used to go off on these very long comedic riffs. So, when we started writing together, we naturally decided to try opening up some of the channels that marijuana opens up. Writing a sketch when you're high on grass is an easy thing to do, because you can be strange and bizarre, and a sketch is only one to four minutes. You can go kind of anywhere your mind takes you. When we write a movie, though, we figure out the story straight, we organize it into three acts and then we write three or four full drafts sober so that the story really lines up and makes sense. Then, we smoke a little and we start to paint in the more unique details and jokes. In the movie itself, we do certainly message that we are stoners. I don't think you need to be high to see our movie at all, but I think a number of people do probably get high and go see it. And, of course, we released it on 4/20, which was no accident. As told to THINK editor Megan Carpentier, condensed and edited for clarity. Jay Chandrasekhar is a director, writer and actor who helped found the comedy group Broken Lizard. His most recent film, Super Troopers 2, premiered in theaters on April 20. 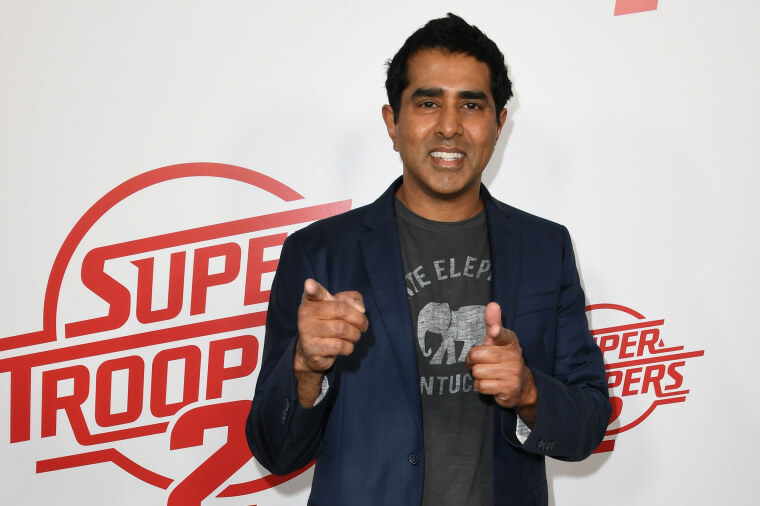 Jay Chandrasekhar is a director, writer and actor who helped found the comedy group Broken Lizard.